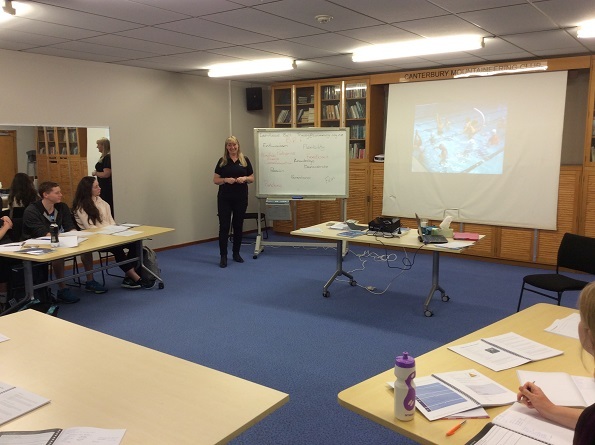 The Swim Teacher Award Course (STA) recently held Christchurch was attended by 13 participants who spent a Saturday developing their skills and understanding in aquatic education. The STA is a fun and informative course educating swim teachers to be the best they can be. The knowledge in the room was wide-ranging and it was wonderful to see everybody participating and sharing ideas no matter how much experience they had. There were participants on the course who had been teaching for years and were now formalising their qualification alongside people who are just starting out in the water. One effective tool used on the course was having the participants to stand up and demonstrate in front of the group, which made the course more interactive and interesting. One highlight from the day was they Water Safety section, teachers can use what they learn and incorporate it into their everyday teaching. During a communication activity Lee-Ann, Education Advisor Canterbury started singing and banging on tables, creating an example of chaos. At first this was met by groans of “that’s not fair”, however the participants quickly realised the value behind it as it depicted what a typical busy and noisy teaching environment could look like. Lee-Ann shared effective tools to ensure she could be seen and heard during a noisy teaching session. The participants were from various organisations including Selwyn Aquatics, Wharenui Swim Club, Sockburn Swim Club and two Christchurch high schools; Hillmorten High School and Papanui High School. This allowed the participants to discuss and understand how different organisations deliver learn to swim at their pool. The students from Hillmorten High School and Papanui High School will be completing their STA at school, assisting the year 9 students in the pool under guidance of their Physical Education teachers and Swimming New Zealand. It was a great course enjoyed by everyone. This was evident over lunchtime which was spent in the classroom with a lot of chatter and laughter as everyone ate, showing a good team rapport had developed. For further information you can find out Course Calendar here.